I’m sticking my fingers in my ears!! Runners DO NOT want to hear about CROSS-TRAINING! We hear it all the time – if you want to be fast, running is all you need. Everything else is useless – and may even be harmful. Why are so many multi-sport athletes – duathletes and triathletes – successful when they switch to running? On March 14, 2009, Lukas Verzbicas ran a high school 5K record (14:18.22) at the Nike Indoor National meet. Verzbicas was a freshman. And running wasn’t even his primary sport. When Verzbicas switched to running, results came quickly. He won Footlocker twice (as a freshman and sophomore), won Nike Cross Nationals, set a high-school 2-mile record, and ran a sub-4:00 mile (3:59.71). Is it a coincidence that Verzbicas happened to be the national junior triathlon champion? How about two-time Footlocker champion Jordan Hasay? Jordan came to running from competitive swimming. She continued to do hard swim workouts her first year as a runner. Are Hasay and Verzbicas just “outliers” – talented athletes who happened to compete in two sports? Or is there a link between their multi-sport training and their running success? Surely the answer isn’t hard to find. Swimming and cycling develop metabolic systems that are essential for fast running. And they develop them in a focused way, without taxing other systems – thus greatly reducing the risk of overtraining and injury. Verzbicas logged low running mileage, given the level at which he competed. Lukas’s cycling and swimming volumes were modest. Elite cyclists commonly ride 700+ miles per week; for them, a 100K ride is nothing, just half a day’s training. And Michael Phelps swam 80,000 meters a week (49.6 miles) during his buildup to the 2012 London Olympics. It’s fairly simple to evaluate the benefits of cycling and swimming for runners. Granted, this is Silly Science – no hard numbers, just common sense. Put a competitive runner in the pool twice a week, and see how it affects his race times. Put another runner on the bike two days a week, including some hard hills and sprints, and watch the results. I’m fairly sure the runners’ race times would come down. Why? Because runners who swim and/or cycle can increase their total aerobic training volume with less overall stress on their bodies. So they can recover faster. In Lore of Running, Timothy Noakes compares the leg profiles of Kenyan and American runners. The East Africans have powerful thighs and skinny calves. (Watch David Rudisha set the world 800m record in London). Noakes observes that strong thighs are more important for fast running than strong calves. A Harvard study found that running speed depends on “power to the ground.” And running power comes first and foremost from the thighs. In the video, compare Rudisha’s and Nick Symmonds’s calves (Symmonds finished 5th, in a very respectable 1:42.95). The Kenyan marathoners’ calves are even skinnier. 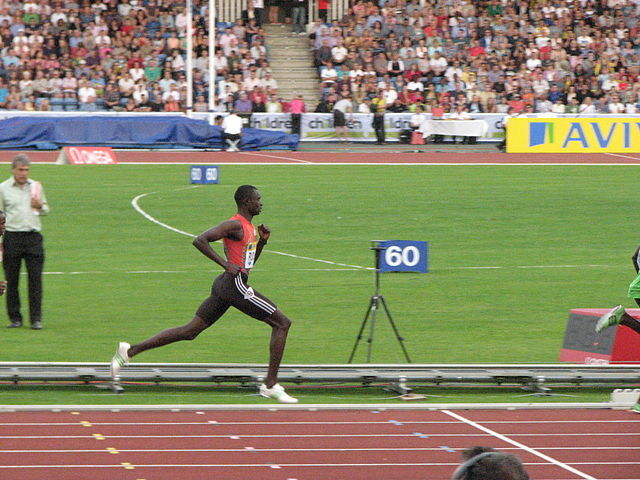 You can’t run as beautifully and fast as Rudisha without powerful thighs. Watch the slow-motion playback after the finish – simply gorgeous. Rudisha leaps like a gazelle. In a word: cycling builds strong thighs and swimming is a wonderful, weight-free way to build aerobic endurance. Listen to former Russian national swimming coach Alec Rukosuev. Rukosuev now coaches triathletes, and he sees swimming as an excellent way to build a strong aerobic base without straining muscles and metabolism. I truly believe that the power of aerobic fitness is unbelievable and if you can combine aerobic conditioning with power on the bike, you can be very, very successful. I think, aerobically, coaching swimming helped me to open my eyes because if I tell my kids in the water that we’re doing a 2400m swim, nobody would blink. If you tell some athletes to run 2400m on the track, they say, are you sure about that? To me, it’s different in the water, but swimmers work out probably harder than a lot of sports. The only advice I can give, if I can give advice, is the most successful Olympic distance [short-distance triathlon] training I had was when I was training for [long-distance] half Ironmans. The speed will come after you build the aerobic base. The problem is everybody wants to be a champion in two months or three months. It’s such a long journey to become an athlete. When you cross-train with cycling and/or swimming, you stress fewer bodily systems than with running. With cycling it’s the thighs; with swimming it’s the cardiovascular system and upper body. With fewer systems to adapt and repair, the body can recover faster, so you can make rapid progress. If you exercise when you’re sick, you’re using energy that the body needs to get well, and it takes longer to recover. Again, I know this is Silly Science, completely lacking hard evidence, but when we train lots of systems at the same time, it takes longer for all of systems to recover — and you can’t train each system as hard. I used to sneer at cross-training, but I’m coming around. Partly, I blame my car. When my 1992 Toyota failed smog, I put it on non-op status and began riding the bike. I was amazed by what it did for my running. Strong thighs? After an enjoyable two weeks riding my $30 yard-sale bike, including long-ish rides across town and quite a few enthusiastic sprints, my legs were itching to run. I cycled to San Francisco Bay, parked the bike, and took off at a jog. After a short warmup, I let out the stops and did some 1-minute repeats. My legs were loving it. And let me tell you, it’s a hoot to run like a young man when you’re 72. I’m hoping that in my next life I’ll be reborn with an athlete’s body, and I’ll find this article and know what to do.